import turtle # Table 1：Turtle Pen Drawing State Methods # Method Description turtle.pendown() # Pulls the pen down -- drawing when moving. turtle.penup() # Pulls the pen up -- no drawing when moving. turtle.pensize(width) # Sets the line thickness to the specified width. # Table 2：Turtle Mothon Methods # Method Description turtle.forward(d) # Moves the turtle forward by the specified distance in the direction the turtle is headed. turtle.backward(d) # Moves the turtle backward by the specified distance in the opposite direction the turtle is headed. The turtle's direction is not changed. turtle.right(angle) # Turns the turtle right by the specified angle. turtle.left(angle) # Turns the turtle left by the specified angle. turtle.goto(x,y) # Moves the turtle to an absolute position. turtle.setx(x) # Moves the turtle's x-coordinate to the specified position. turtle.sety(y) # Moves the turtle's y-coordinate to the specified position. turtle.setheading(angle) # Sets the orientation of the turtle to a specified angle. 0-East, 90-North, 180-West, 270-South. turtle.home() # Moves the turtle to the origin (0,0) and east direction. 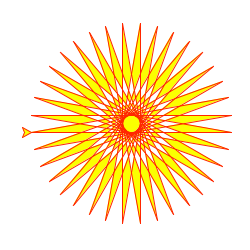 turtle.circle(r, ext, step) # Draws a circle with the specified radius, extent, and step. 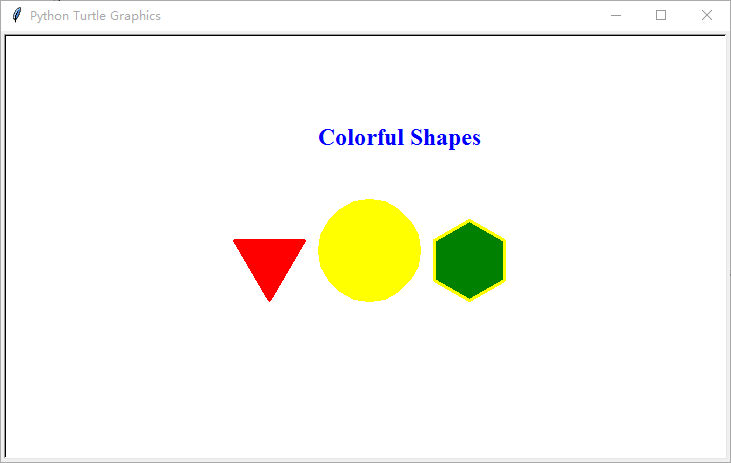 turtle.dot(diameter, color) # Draws a circle with the specified diameter and color. turtle.undo() # Undo(repeatedly) the last turtle action(s). turtle.speed(s) # Sets the turtle's speed to an integer between 1 and 10, with 10 being the fastest. turtle.pendown() # Pulls the pen down -- drawing when moving. turtle.penup() # Pulls the pen up -- no drawing when moving. turtle.pensize(width) # Sets the line thickness to the specified width. turtle.forward(d) # Moves the turtle forward by the specified distance in the direction the turtle is headed. turtle.backward(d) # Moves the turtle backward by the specified distance in the opposite direction the turtle is headed. The turtle's direction is not changed. turtle.right(angle) # Turns the turtle right by the specified angle. turtle.left(angle) # Turns the turtle left by the specified angle. turtle.goto(x,y) # Moves the turtle to an absolute position. turtle.setx(x) # Moves the turtle's x-coordinate to the specified position. turtle.sety(y) # Moves the turtle's y-coordinate to the specified position. turtle.setheading(angle) # Sets the orientation of the turtle to a specified angle. 0-East, 90-North, 180-West, 270-South. turtle.home() # Moves the turtle to the origin (0,0) and east direction. turtle.circle(r, ext, step) # Draws a circle with the specified radius, extent, and step. turtle.dot(diameter, color) # Draws a circle with the specified diameter and color. turtle.undo() # Undo(repeatedly) the last turtle action(s). turtle.speed(s) # Sets the turtle's speed to an integer between 1 and 10, with 10 being the fastest. # Table 3: Turtle Pen Color, Filling, and Drawing Methods # Method Description turtle.color(c) # Sets the pen color. turtle.fillcolor(c) # Stes the pen fill color. turtle.begin_fill() # Calls this method before filling a shape. turtle.end_fill() # Fills the shapes drawn before the last call to begin_fill. turtle.filling() # Returns the fill state: True if filling, False if not filling. function.clear() # Clears the window. The state and the position to the original default value. turtle.reset() # Clears the window and reset the state and position to the original default value. turtle.screensize(w, h) # Sets the width and height of the canvas. turtle.hideturtle() # Makes the turtle invisible. turtle.showturtle() # Makes the turtle visible. turtle.isbisible() # Returns the turtle visible. turtle.write(s, font=("Arial", 8, "normal"))# Writes the string s on the turtle position, Font is a triple consisting of fontname, fontsize, and fonttype. turtle.color(c) # Sets the pen color. turtle.fillcolor(c) # Stes the pen fill color. turtle.begin_fill() # Calls this method before filling a shape. turtle.end_fill() # Fills the shapes drawn before the last call to begin_fill. turtle.filling() # Returns the fill state: True if filling, False if not filling. function.clear() # Clears the window. The state and the position to the original default value. turtle.reset() # Clears the window and reset the state and position to the original default value. turtle.screensize(w, h) # Sets the width and height of the canvas. turtle.hideturtle() # Makes the turtle invisible. turtle.showturtle() # Makes the turtle visible. turtle.isbisible() # Returns the turtle visible. turtle.write(s, font=("Arial", 8, "normal"))# Writes the string s on the turtle position, Font is a triple consisting of fontname, fontsize, and fonttype.